Preheat the oven to 350 degrees. Line an 8×8 baking dishing with parchment paper; coat lightly with cooking spray. In a large bowl of the bowl of stand mixer, beat butter and sugars until fluffy. Beat in egg and vanilla until combined. Scrape down the sides. With the mixer on low, stir in the flour, baking powder, salt, and graham cracker crumbs until mixed. Spread 2/3 of the dough on the bottom of the prepared baking dish. 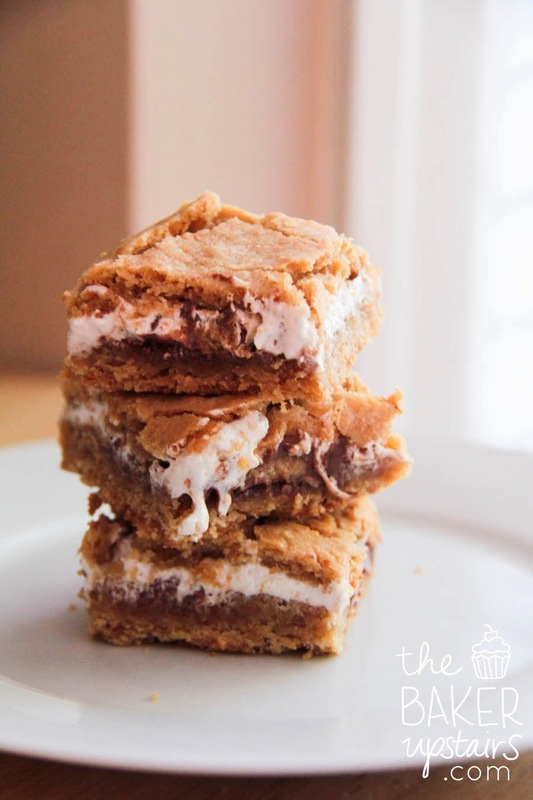 Lightly press the peanut butter cups into the dough, then spread marshmallow fluff on top. Press the remaining dough on a non-stick surface into the shape of an 8×8 square. Place the square on top of the fluff and press down lightly. Bake for 30 minutes or until the edges just begin to brown. Allow to cool for at least two hours to give the bars a chance to set, then remove from the pan and cut into squares with a large, sharp knife. Sad! I seriously loved these, Andrew thought they were too rich but I thought they were tasty! I also ate most of them by myself...what..don't judge me.